Performance, from an economic point of view, has been one driving force toward improving asphalt and paving technology. Finding an environmentally friendly solution has become a significant objective. These two factors have encouraged the development of polymeric treatment. Research scientists and ULTRAPAVE®‘s formulators have been steadily advancing the use of polymers in hot mix asphalt pavements. They found that using polymers as an aggregate treatment enhanced water-proofing and adhesion. ULTRACOTE® polymeric aggregate treatment is widely embraced as an important advance in enhancing pavement performance and resisting damage due to the ravages of weather and time. The particles in ULTRACOTE® are extremely small (~0.5 microns). Their molecular structure allows them to cling together, and their diminutive size enables them to fill small cavities and weak spots in the aggregate. The process is not unlike applying a primer coat before painting an object, such as a house or car. In a similar way, ULTRACOTE® improves bonding and protection for the aggregate that makes up a highway. The important characteristics of the polymer are that it is waterproof and has a high affinity for asphalt. The following photomicrographs were prepared on an ElectroScan E-3 Environmental Scanning Electron Microscope (ESEM) at Western Research Institute (WRI) of Laramie, Wyoming. Since the early 1960’s WRI has worked with the Federal Highway Administration to clarify the chemistry of petroleum asphalt to enhance performance in roadways. These pictures produced by the ESEM have been color highlighted to make it easier to identify the subjects. The aggregate (stone) is blue, ULTRACOTE® is gold, and the asphalt oil is black. The first ESEM photomicrograph shows the surface of aggregate coated with asphalt (upper left). The white scale bar represents 50 microns. For comparison, a 270 mesh sieve has an opening of 53 microns or .0021 inches. The next ESEM photomicrograph is of the surface of aggregate coated with ULTRACOTE® (middle left). The white scale bar represents 50 microns. The largest stone is about 250 microns (60 mesh sieve size) and the other five large stones are about 100-125 microns (120-140 mesh sieve size). 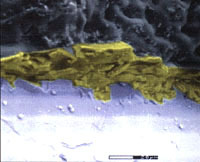 This last photomicrograph (lower left) shows the outer edge of a cross-section of aggregate that was coated with 0.1% ULTRACOTE®, then coated with asphalt. During this exposure, an electron beam was focused on these three components to determine their reaction to the heat of the beam. The asphalt began to flow after a few minutes as depicted by the ropy looking texture. The ULTRACOTE® appears to be unaffected by the electron beam’s heat. ULTRACOTE® is environmentally friendly in every phase of its use. The material is non-toxic and non-hazardous, making it easy to work with and clean up. It is an inert emulsion of the co-polymers styrene and butadiene in a water based system. There are few handling precautions required in the Safety Data Sheet (SDS), and a spill can be cleaned up with sawdust or vermiculite to absorb the liquid. Disposal can then be made as with any other non-hazardous industrial waste. ULTRACOTE®‘s properties also improve environmental issues in the application process. Asphalt adhesion is improved dramatically when the aggregate is pre-treated with the material. These pictures (above right) show a clear demonstration of reduced airborne particles. Eliminating noxious fumes and particulates increases safety to people and the environment. ULTRACOTE® is simple to use and can be directly applied to the aggregate at the hot plant. Compare a lime treatment plant with one using ULTRACOTE®. This PC-3 pump (left) is an approved application device that mixes the latex polymer with water according to the specifications for the job. A hot plant using lime to stiffen the binder (bottom left) can have environmental risks. The equipment is bulky, mechanically driven, and susceptible to spills. Hydrated quick lime is corrosive and can actually burn the skin, making wind-borne particulates a real concern. Evidence also suggests that lime may lower the fatigue life of the hot mix. This is not so with ULTRACOTE®. Improving resiliency is a key to increasing long and short term asphalt performance and elastomeric modification of asphalt oil is being done throughout the world. ULTRACOTE® adds more resiliency to the hot mix as a stress absorbing membrane interlayer (SAMI). The ULTRAPAVE® team are concentrating on this area for advances in the future. ULTRACOTE® is an excellent anti-strip agent because it has a high affinity for asphalt. Preventing the stripping of asphalt binder from the surface of aggregates is extremely important in extending pavement life and many millions of dollars in maintenance work can be saved each year. Two to three pounds of ULTRACOTE® per ton of aggregate will provide a stress absorbing polymeric layer on the aggregate, thereby reducing damage due to thermal cycling. When properly applied, it will turn a hydrophilic aggregate (likes water) into a hydrophobic aggregate (hates water), increasing the water resistance of the hot mix. Thermal cycling is one of the most powerful forces of erosion. Heating and cooling causes damage to pavements when the water expands and contracts in the pores. Water can wedge into rock through fissures or cracks and damage to roadways occurs as this force breaks down the aggregate and the bond between the rock and asphalt oil. In the summer of 1995 Seacon Construction of Juneau paved two projects using the same mix design, oil supply, aggregate source, paving crew and paving procedures. The first was Loop Road, a three mile section of highway from the Juneau Airport to the Mendenhall Glacier. The second was Egan Drive, a six mile section from the Juneau Airport to the state capitol area downtown. The aggregate for the Egan Drive project was treated with 0.335% ULTRACOTE®, while the Loop Road aggregate was untreated. In the winter of 1995, the temperature in Juneau dropped to a low of -20° F for five days. Then it warmed up to +38° F and rained. Talk about a giant modified Lottman stripping test! The untreated Loop Road project showed many incidents of thermally induced cracking. However, the ULTRACOTE®-treated Egan Drive project showed very few. This field project seems to validate the added benefit of resistance to thermal cracking by ULTRACOTE®. The ULTRACOTE® concentrate is delivered to the job site and must be diluted to 15% solids prior to use. This is accomplished automatically when using an ULTRAPAVE® approved application unit. The ULTRACOTE® is then applied to the aggregate stream. A simple field test of proper coating is to verify that a drop of water will “bead” on the treated rock. For a complete discussion of the field and application procedures, request a Technical Information document from ULTRAPAVE®. Contact information can be found here. ULTRAPAVE® approved application units, like the PC-3 Unit, have two pumps that discharge through a hose to the aggregate feed belt; one pump for water and one for the ULTRACOTE® concentrate. A valve is provided in the combined discharge line to permit sampling of the ULTRACOTE® material. A signal from the aggregate belt scale is fed to the computer which controls liquid flow rates to correspond to the aggregate feed rate. The computer control panel provides for adjustment of the percent of ULTRACOTE® applied to the aggregate, the aggregate moisture content, and the ULTRACOTE® concentrate-to-water ratio. A readout display is provided which shows percent, rate per time and total units delivered. Millions of tons of hot mix asphalt have been treated on highway construction projects in the Northwestern United States using Ultracote. New systems and innovative technologies like these will protect our paved infrastructure for years to come. ULTRAPAVE® is committed to making a difference. We are there in your airport, in your roads and highways, and in your parking lots. ULTRACOTE® can be used in your next project that requires sealing, such as chip seal paving or exposed aggregate cement work.